United States Navy. 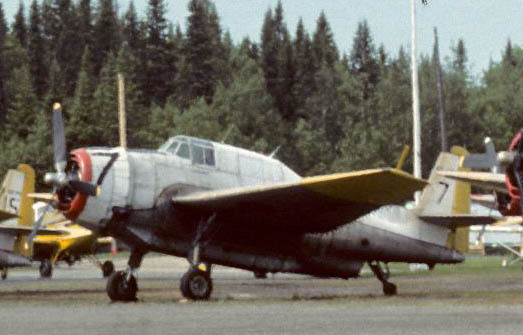 TBM-3E. Construction number 3063. Sonora Flying Service, Columbia, CA, 1963. Registered as N6826C. Flew as tanker #C53. John P. Lippott, Salmon, ID, 1963-1966. Idaho Aircraft Co, Boise, ID, 1969-1972. 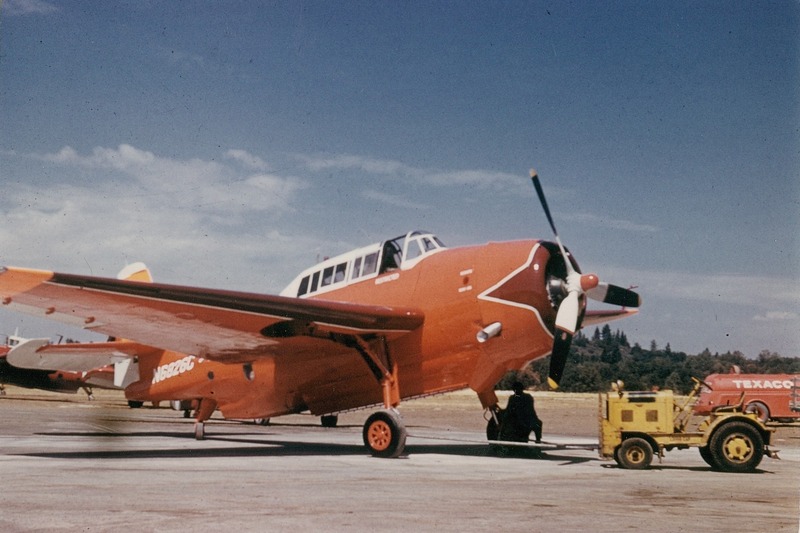 Sonora Flying Service TBM N6826C #C53, Columbia, California. 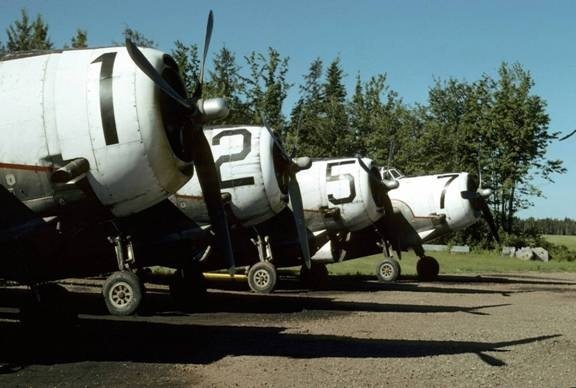 Note – Skyway TBM CF-KCJ, which crashed in Washington State in 1969, was also numbered 607. The number was reassigned to CF-AGN in 1972. 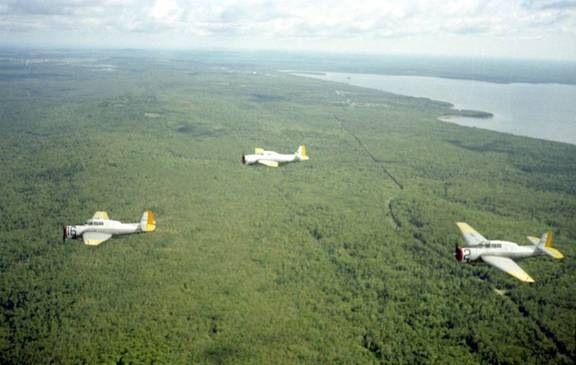 1972 – Flew in Quebec in 1972, Pilot Buchanan. 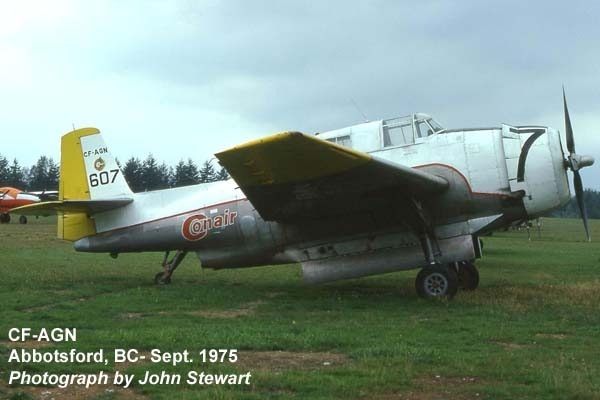 1973 – Did not fly in NB. 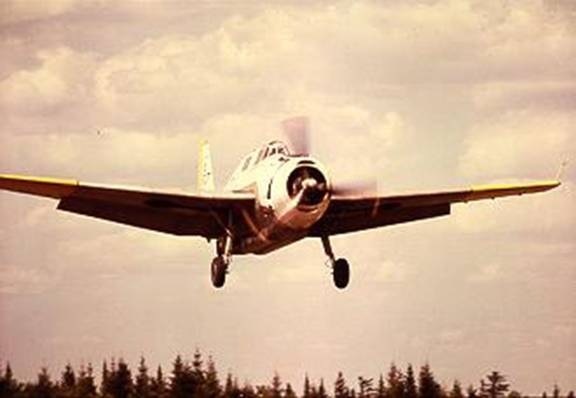 1974, 1975 – Flew in NB, Pilot Losee. 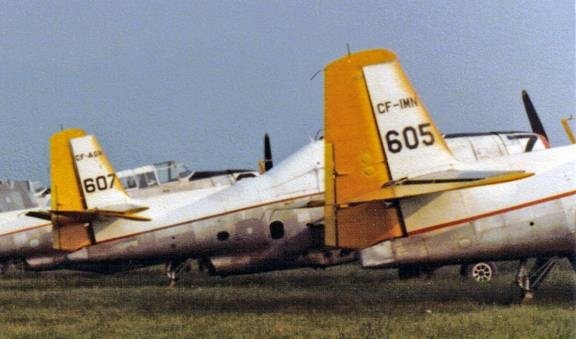 1977 – FPL purchased FAGN from Conair Aviation Limited in August 1977. Pilot Nelson. 1978, 1979 – Pilot Archer. Repainted and renumbered (to #7) to fleet standard after 4 July, 1978. Used for fire bombing both years. 1980 – Pilot Archer. 1981, 1982 – Pilot Hopping. 1983 – Pilots Hopping and Wood. FAGN was one of a team of 6 TBMs plus one spare that conducted firebombing for the Department of Natural Resources. 1987 – Registration cancelled by FPL. Four of the 8 TBMs purchased from Conair in 1977. 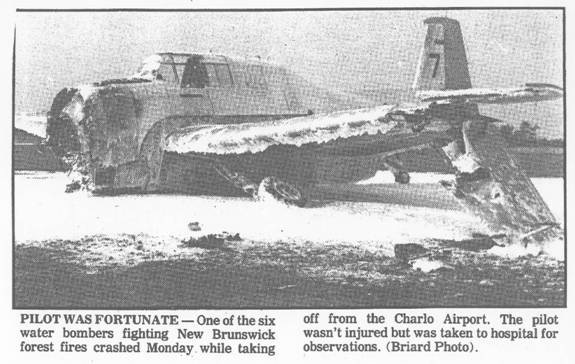 5 July 1977, Fredericton, NB. They are #601 FIMI, #602 FIMK, #605 FIMN and #607 FAGN. TBM #7 (rear) flying with #16 FKCM and #2 FIMK, no date. Close-up of above image; TBM #7 at Boston Brook, 1981. FPL TBM #7: the aftermath of the crash. Photo and caption from local newspaper. As pilot of the above aircraft, i can assure all readers that the gear was NOT, and I repeat, NOT selected up to early. The aircraft was at least 140 ft in the air, when the blade broke off, causing fire, and immediate departure of the remaining two blades. 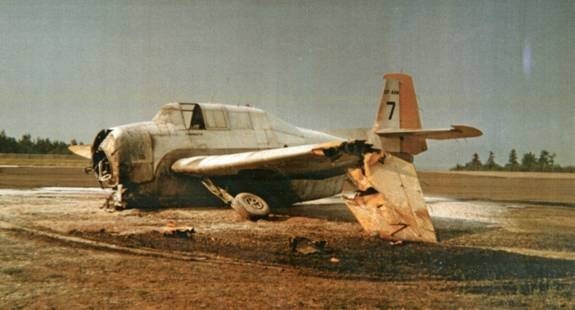 The aircraft then crashed some 10 to 15 seconds later on the runway.